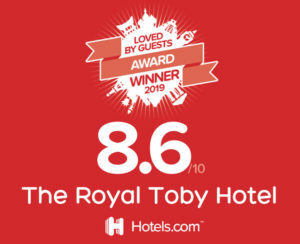 Here at The Royal Toby Hotel, we pride ourselves on our hospitality, friendliness and efficiency. Whether you are on a business trip, or here for a special weekend break, we will ensure you enjoy your stay. Dine in our superb restaurants, relax in our cozy bar, venture out and about or stay in, the choice is yours. "Beautifully decorated and a lovely atmosphere as always good friendly staff, food excellent. We have been coming here for many years and have always enjoyed our visits… Hope you carry on for many years to come." 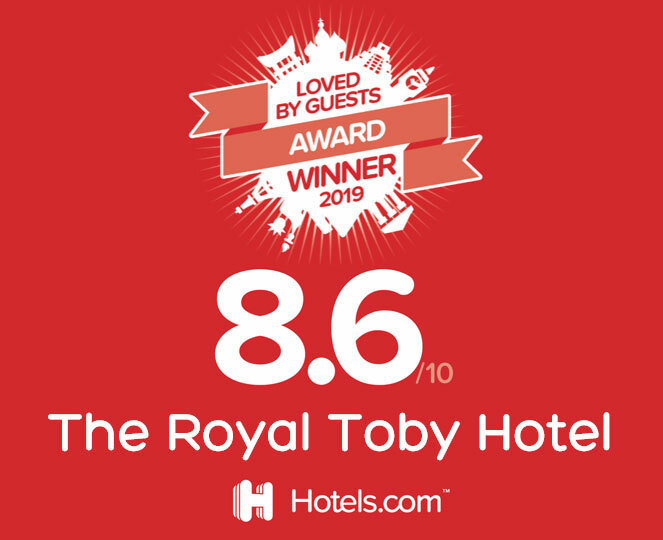 We are delighted to have been awarded the “Loved by Guests Award” by Hotels.com for the 2nd year running. We value guest feedback as we strive to improve the services we offer. Thank you to those guests who took the time to review their visits to the hotel, our restaurant and function room. Tick the box to confirm you agree to abide by our terms and conditions including opting in to receiving marketing materials for offers which we hope will interest you. All membership cards remain the property of Deckers Hospitality and are not transferable. Any misuse of the card may result in the membership being revoked. You must make a reservation every time you wish to redeem your loyalty club discount. Discounts will not be applicable to any ‘offers’ or reduced or fixed price menus. Discounts may not be available on special event dates during the year, please check with our individual restaurants, Deckers Hospitality reserves the right to make any date a special event date but will generally include Valentine’s Day, Mother’s Day, Bank Holidays and Festive Holidays. Personal information regarding members remain strictly confidential and will only be used to provide members with information regarding Deckers Hospitality, its venues, promotions and any special events. To ensure we deliver you the best possible service please contact us on [email protected] should you have any changes to your personal details. Your card must be produced with a signature to validate membership privileges. Deckers reserves the right to amend the rules and or terms and conditions at any time. Changes to terms and conditions will be notified by email, it is therefore a condition on membership that you provide a current email address. Deckers Hospitality reserve the right to revoke any membership at any time. By becoming a member of Deckers Loyalty Club you are agreeing to opting in to Deckers sending you marketing material by post, email or SMS containing features, news, events and offers which we hope will be of interest to you.